Difficulty: Long drive on day one. Cycling and kayaking flexible in terms of difficulty. ​Tuyên Quang was once entirely settled by Thai people, but from the 13th century onwards were integrated into the Trần Dynasty, who named it Tuyên Quang. The province has widely varying topography covering high mountains deep valleys; the dominant elevation of the province is in the range 200–600 metres (660–1,970 ft). The province is in the foothills of the Northern Highlands, and the northern part, particularly Nà Hang district has steeper slopes are steep with hills taller than 1,400 metres (4,600 ft). 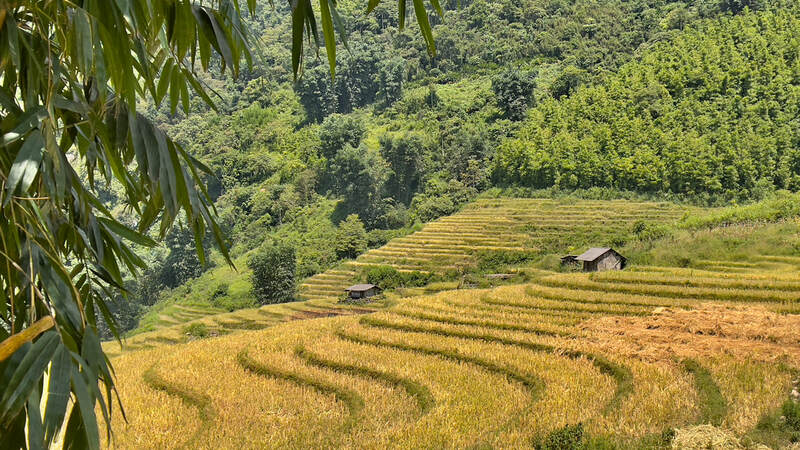 Meet with your guide and depart from Sapa by private car. 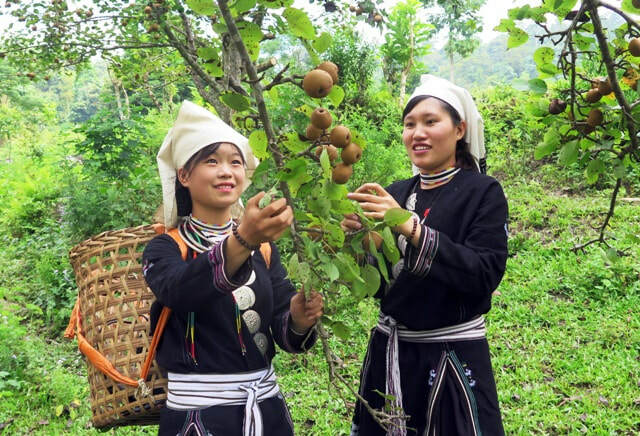 As we travel down Muong Hoa valley, we will leave the tourists behind and travel through a number of villages home to the Black Hmong and Dao ethnic minority groups. These areas have beautiful rice terraces and spectacular mountain scenery. Next, we turn towards the lowland plains and cinnamon plantations of Bảo Yên and Bảo Thắng. We will lunch with the Red Dao ethnic minority in the Quang Bình area of Hà Giang. Their textiles, which are predominantly red, are unlike any other South-east Asian minority group, however, their language stems from the Hmong-Dao linguistic family. After lunch, we will continue through beautiful green tea plantations towards Tuyen Quang and onwards towards our destination via winding mountain passes and many small tribal villages. 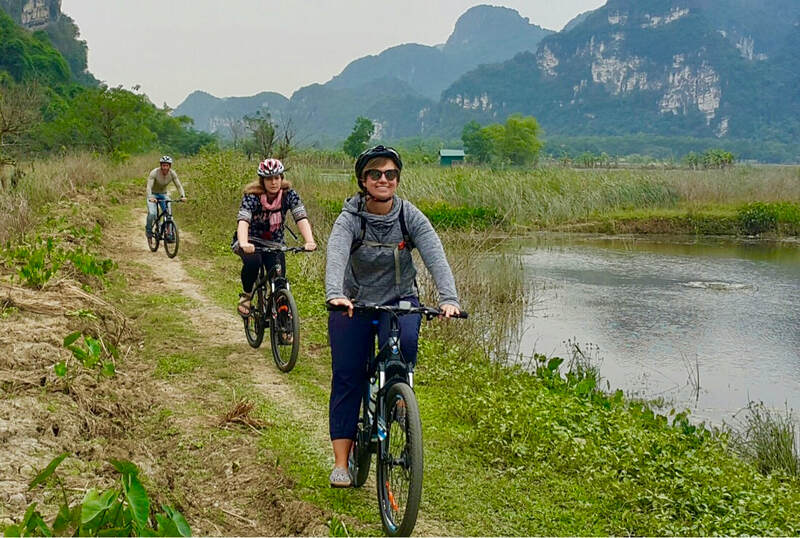 If the weather is clear, expect to see epic limestone karst peaks stretch out in every direction, many are lined with ancient forests. Valleys are planted with corn, rice and cassava. We anticipate arriving at our destination in the early evening. Accomodation for the three night will be with the Tay tribe in local stilt houses. Rooms are basic, but comfortable, with a mattress, warm blankets and a mosquito net. There are western toilets, warm showers and wifi connectivity. Total travel time is approximately 8 hours excluding breaks and stop offs. Lâm Bình is a rural district and home to some of the most stunning scenery in all of Vietnam. The district is also home to many rare mammals, primates and birds. Day two is very active with an early start and a jungle trek to a Flower Dao tribal village. Morning starts with a steep climb through primal rainforest home to a great deal of birds, rare primates and reptile. Lunch will be shared with a local family before a walk down to the Gam River and pick up by long boat. The trek can vary between 6km and 10km. 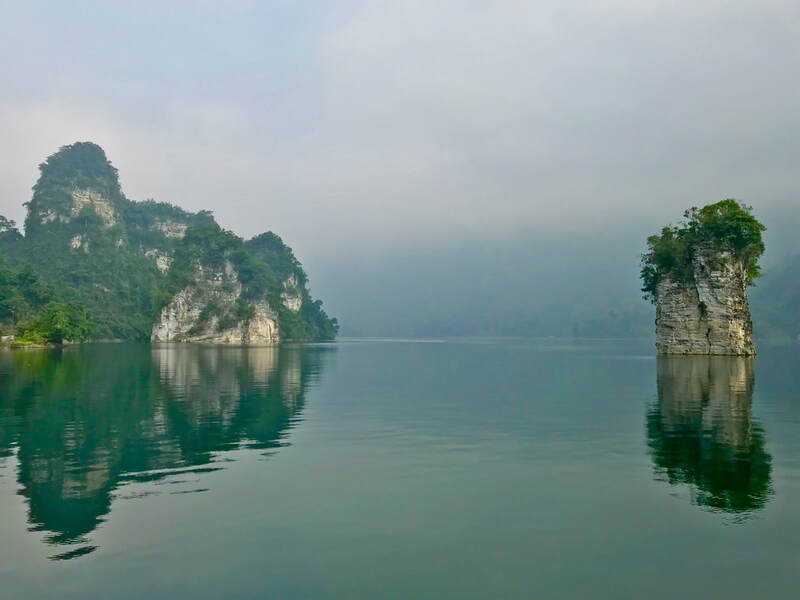 The boat trip will follow the Gam River up to a beautiful waterfall with options to swim on a warm day. After breakfast, we will have a morning to explore the area by bicycle. The afternoon would be spent kayaking on the Gâm River. Described locally as the flowing hair of a sleeping, mountain girl, the Gam River is a treasure of stunning landscapes and wild ecosystems rich in flora and fauna. As an alternative, we have the option of taking a local ferry from the port in Yên Hoa we can take a local motorbike up to a traditional Dao Tiền village where we will stay with a local family. The Dao Tiền are the only Dao group who wear indigo dyed, batik skirts characterised with images of coins. With intricate silk designs, the costume is one of the most elegant of the 54 ethnic groups living within Vietnam. Pick up at the homestay for the return journey to Sapa. We will have the opportunity to stop for lunch with the Nung ethnic minority and visit the Pa Then textile weavers. The Pa Then produce skilled carpenters, basket weavers and weavers, but with fewer than 7000 members, this minority group is fragile. The tropical climatic seasons are the monsoon and dry season. Rainfall occurs generally during the monsoon months of May to October, which is also the summer season. However, it is unevenly distributed due to varying topography. The northern region of the province experiences a long winter with low temperatures, mist and rare frosts. ​Tuyen Quang has a rich range of flora and fauna. The six mammal species particularly identified in the area are the TIGER, the Asian black bear, the clouded leopard, the Indian muntjac (a small cervine), black gibbon, the apricot panther, the sambar (another small cervine) and the Sumatran serow (a small caprine). The primates identified are the Tonkin snub-nosed monkey and Phayre's leaf monkey. Whilst Sapa is a famous mountain retreat, enormously popular with Vietnamese and foreign tourists. Tuyen Quang, on the other hand, is hardly ever visited by travellers. As a results, homestay accommodation is comfortable, but quite basic. Rooms are small with reasonable sized beds, firm mattresses and mosquito nets. There are hot showers and western style toilets. Food options are limited but fresh local ingredients ensures that quality is high. Expect rice and noodle based meals for the duration of the trip.